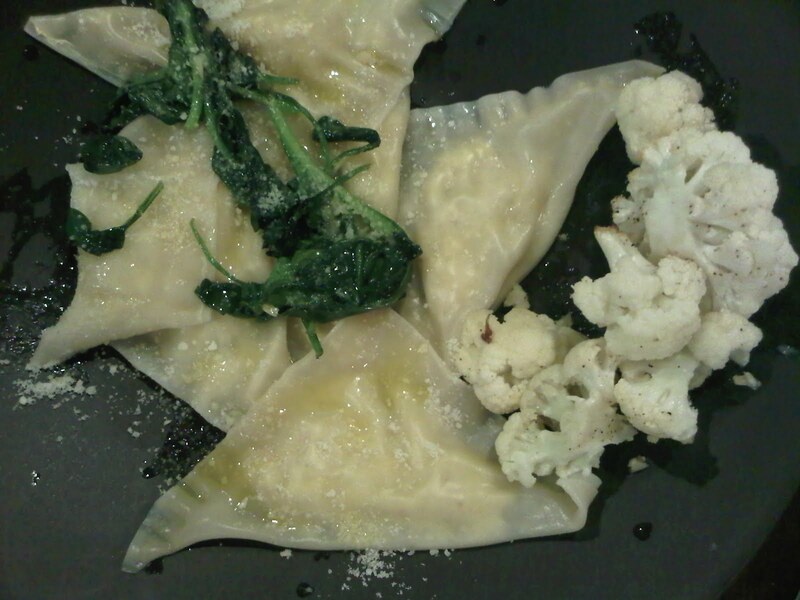 A blog dedicated to new cooks, discovering recipes, quick meals, and delectable desserts. A celebration of friends sharing experiences through food. I made this super easy sauce and put over spaghetti squash with grilled chicken, but you can definitely put over regular pasta and it would probably taste even better! You could even use it as a sauce for the grilled chicken alone! So yummy! Throw all the ingredients into a food processor and blend. Serve over pasta or spaghetti squash. For Easter, I made Pioneer Woman's Hot Corn Dip recipe and it was delicious! Brush the corn cobs with vegetable oil, sprinkle with a little salt, and place on a grill pan for about 10 minutes, turning constantly. Remove it from the heat to cool. Cut the kernels off the cobs once they're cool enough to handle. In a large skillet over medium heat, melt the butter and add the onion, garlic, bell peppers, and jalapeno. Stir and cook for 5 minutes, until the veggies are soft and golden. Remove the skillet from the heat to let the veggies cool slightly. In a mixer, combine the cream cheese, mayo, sour cream, and 2/3 of the Monterey Jack. Mix with the paddle attachment on low until combined. Add the green onions, the veggie mixture, the corn, and the green chilies. Mix on low until just combined. Spread the mixture in a baking dish and sprinkle with the rest of the Monterey Jack. Bake for 20 to 22 minutes, until bubbly and golden. Remove from the oven and serve warm with tortilla chips! Preheat the oven to 350. Lightly grease a cookie sheet. Chop and sautee the onions, add in the ground beer, salt & pepper and brown. Drain any excess liquid from the beef. Cook the rice-a-roni according to package directions and add to the meat mixture. Roll out each biscuit to a large rectangle, fill with the filling and wrap the seal. 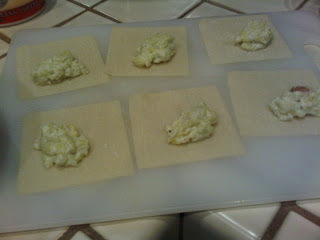 Cook for 13-15 mins (see biscuit instructions) until the Piroshkis are slightly golden. Heat olive oil in a 6 quart enameled dutch oven over medium-high heat. Once oil is hot add onion and sautee until translucent. Then add in shredded chicken and green chilies. Add garlic and saute 30 seconds longer. Add chicken broth, cumin, paprika, oregano, coriander, cayenne pepper and season with salt and pepper to taste. Bring mixture just to a boil then reduce heat and simmer. Throw in a couple of the cobs (without the kernels) and let it simmer for a while (brings in a lot more flavor). Add cream cheese and stir until nearly melted (it will break down in little bits and will appear to look like separated cheese but it will eventually melt). Stir in the corn kernels you cut off, and 1 can of Cannellini beans, then process 3/4 of the remaining beans along with 1/4 cup broth from the soup in a food processor/blender or hand blender until pureed, add bean mixture to soup along with remaining 1/4 can of beans (pureeing the beans makes the soup so much creamer). If you like an even thicker consistency, you can puree more beans. Simmer for a 30 minutes longer. Mix in fresh lime juice and serve with Monterrey Jack cheese, chopped cilantro and tortilla chips for dipping if desired. Once meatballs rise to the top and orzo is fluffy, your soup is ready! Roast the squash and apples covered in olive oil and thyme in the oven for approx. 20 mins (on 375 degrees). Meanwhile, in a stove top pan, saute the onions and garlic. Add curry powder then the roasted squash and apples to the onion mixture and add the stock. Simmer for 30 minutes to an hour. Using a hand blender, puree until smooth. Add additional broth if the consistency is too thick. I've only made chicken pot pie a few times but have found this recipe to be the best/most flavorful! It's from my Crate and Barrel Bride and Groom's First Cookbook. Add onion, garlic, thyme and lightly season with salt and pepper. Sautee for about 5-7 minutes until onion is soft. Add wine and cook until evaporated, about 2 minutes more. Sprinkle flour over onion and stir until mixed well. Add the chicken stock and stir until mixed well and slightly thickened. Add chicken, peas and carrots and alfredo sauce. Sift together the flour, salt, and baking soda in a mixing bowl. Combine the egg, milk, and vanilla and bring to room temperature in another bowl. Slowly add the flour mixture, scraping the sides of the bowl until thoroughly combined. Cream the butter, starting on low speed to soften the butter. Add the sugars. Increase the speed, and cream the mixture until light and fluffy. Reduce the speed and add the egg mixture slowly. Increase the speed and mix until well combined. Using an ice cream scooper, scoop onto parchment-lined baking sheets, 6 cookies per sheet. Bake for 12 to 14 minutes, checking the cookies after 5 minutes. Rotate the baking sheet for more even browning. To freeze cookie dough: Roll into parchment paper and form into logs, Or scoop onto parchment lined baking sheet and freeze until the cookie balls are completely frozen so that you can store in a zip lock bag. Roll out frozen cookie dough and slice into 1-inch rounds, arrange slices on cookie sheet and bake. At this point you can scoop onto parchment paper and roll into a log. Twist the ends of the parchment and wrap the log in plastic wrap to store in the freezer. For Gabriella's 1st birthday, I thought it would be fun to decorate everything pink and girly. I was originally planning on making a large cupcake, but then saw a picture of an "ombre style" Rosette Cake that a friend had posted on Facebook and knew I had to make it. After watching a few YouTube videos, I knew this was the cake I had to make! I used a box cake mix and baked two bottoms so the cake would be tall enough. Once the cake finally cooled, I layered the two cakes with frosting in the middle as a "glue" and then using a serrated knife, I cut around the edges to make the cake as even as possible. I also used store bought frosting and went to Michaels and purchased the 1M Wilton tip to make the flowers. 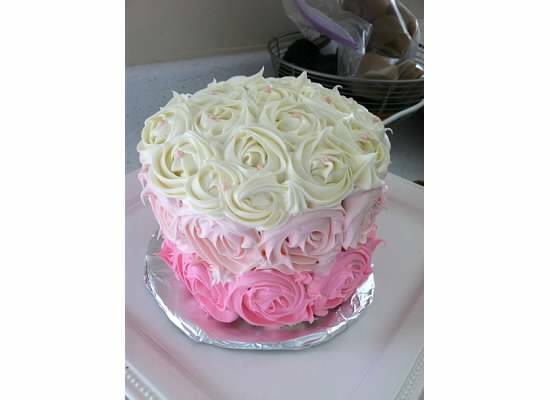 I followed the instructions on http://iambaker.net/rose-cake-tutorial/ to make the flowers. Surprisingly, the decorating part was the easiest/fastest! 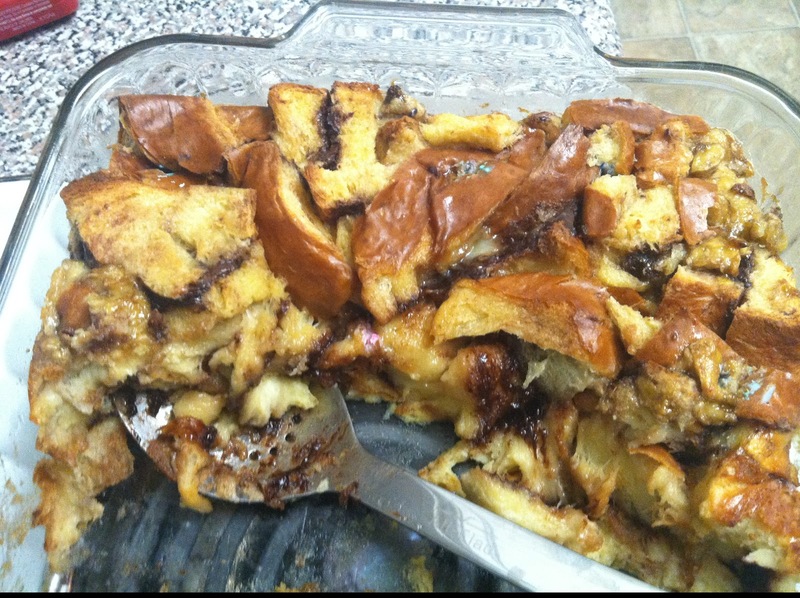 Ian saw this recipe in the October issue of the Rachael Ray magazine and requested I try to make it. It turned out to be yummy and we have enough leftover for a couple days! 1.Preheat the oven to 400°. Grease a 9-by-13-inch baking dish. Cook the pasta according to package directions until just barely al dente; drain. 2.Meanwhile, season the turkey with salt and pepper. In a large skillet, heat 1 tbsp. butter over medium-high heat. Add the turkey and cook until browned, 1 to 2 minutes. Transfer to a bowl. 3.Add 2 tbsp. butter to the skillet. Add the mushrooms and thyme; season with salt and pepper. Cook until the mushrooms start to soften, about 3 minutes. Transfer to the bowl with the turkey. 4.Melt the remaining 3 tbsp. butter in the skillet. Whisk in the flour and cook for 1 minute. Whisk in the milk and broth and bring to a boil, then simmer for 2 to 3 minutes to thicken. Stir in ½ cup parmesan and the peas and carrots. Season with salt and pepper. 5.Add the pasta and turkey-mushroom mixture to the sauce and toss well to combine. Transfer the pasta mixture to the prepared baking dish. Sprinkle with the remaining ½ cup parmesan. Bake until the top is golden-brown and the sauce is bubbling, 12 to 15 minutes (shorten the baking time by at least 5 minutes if you’re planning on freezing this for later). 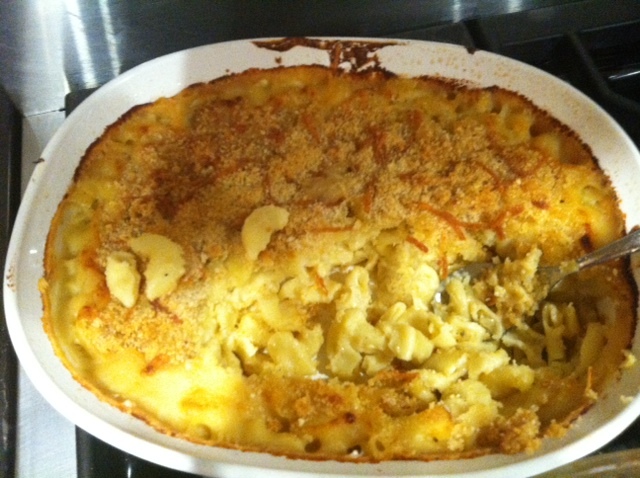 2.Cook and drain macaroni according to package directions; set aside. 3.In a large sauce pan melt butter, add flour mixed with salt and pepper, using a whisk to stir until well blended. 4.Pour milk and cream in gradually; stirring constantly, Bring to boiling point and boil 2 minutes, reduce heat and cook (stirring constantly)for 10 minutes. 5.Add shredded cheddar little by little and simmer an additional 5 minutes, or until cheese melts. 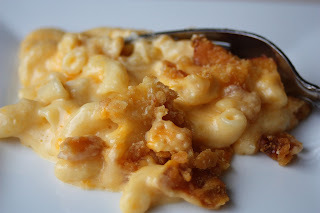 6.Remove from heat and Add macaroni to the saucepan and toss to coat with the cheese sauce. 7.Transfer macaroni to a buttered baking dish. 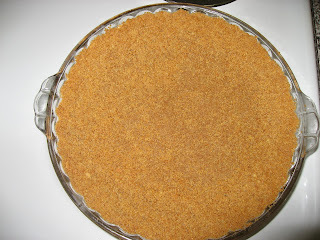 8.Sprinkle with breadcrumbs and parmesan cheese and bake 20 minutes until the top is golden brown. I saw this recipe on Food Network and had been thinking about it since, so I decided to make it for book club! It turned out just as amazing as it sounds! Spray or butter a 13 by 9 by 2-inch baking dish. Preheat the oven to 350 degrees F. Bake until the pudding is set in the center, 45 to 50 minutes. Cool slightly. Serve warm. Lately, I've been out of good ideas for a fast dinner. This was super easy and tasted really good! The best part - you can be as creative as you want! Recently, we went on a Costco binge and bought easy frozen items that we can throw in the oven/microwave for a quick weeknight dinner. One of those items was the frozen Orange Chicken! This fried rice recipe plus the orange chicken from Costco tasted better than our favorite Chinese takeout restaurant! We'll definitely be making this again, and again, and again. Sautee the chopped onions, carrots, celery in a little bit of olive oil with fresh pressed garlic and ginger. Once the vegetables are soft, make an opening in the middle of the pan and crack one-two eggs (depending on how much you like). Scramble the eggs in the middle of the pan. 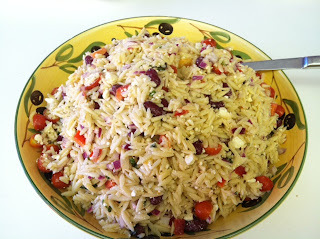 Once scrambled, combine with the vegetables and add the frozen brown rice. Mix all together and add the low sodium soy sauce, pepper, and a little bit of sesame oil (i think this was the key in making it taste so good). Once combined and mixed together, at the very end, throw in some chopped green onions and sesame seeds. We don't normally buy spinach in our household, but it sounded good the other day. There's really no recipe for this other than to sautee a some shallots, garlic and then throw in the spinach. I added a little salt and pepper and then at the end poured in a little balsmic vinegar. Viola! A yummy side dish made in 5 mins! I wanted to make something out of the ordinary for Easter this year and thought that Eclair's would be a fancy treat. This was the first time i've made this French dessert and although tasty, I think the French bakeries i've been to taste a little better. 1.Preheat oven to 450 degrees F (230 degrees C). Grease a cookie sheet. 2.In a medium saucepan, combine 1/2 cup butter and 1 cup water. Bring to a boil, stirring until butter melts completely. Reduce heat to low, and add flour and salt. Stir vigorously until mixture leaves the sides of the pan and begins to form a stiff ball. Remove from heat. Add eggs, one at a time, beating well to incorporate completely after each addition. With a spoon or a pastry bag fitted with a No. 10, or larger, tip, spoon or pipe dough onto cookie sheet in 1 1/2 x 4 inch strips. 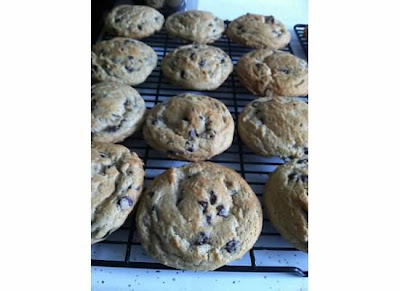 3.Bake 15 minutes in the preheated oven, then reduce heat to 325 degrees F (165 degrees C) and bake 20 minutes more, until hollow sounding when lightly tapped on the bottom. Cool completely on a wire rack. 4.For the filling, see pastry cream recipe below. Cut tops off of cooled pastry shells with a sharp knife. 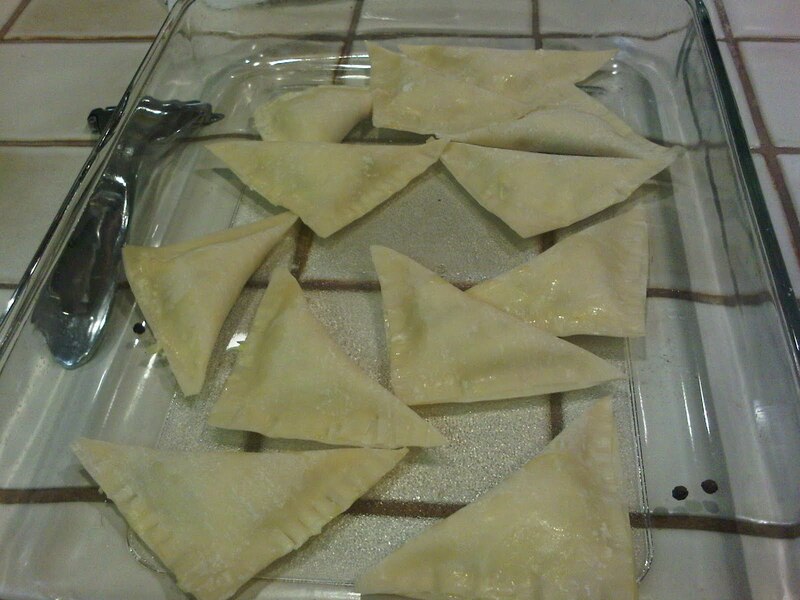 Fill shells with pudding mixture and replace tops. 5.For the chocolate ganach icing, boil 2 cups of heavy cream. Pour cream into a bowl and add chocolate chips. Let chocolate chips soak in hot cream for 2 minutes and then using a whisk, stir vigorously until chocolate thickens. Drizzle over filled eclairs. Refrigerate until serving. 1.In a heavy saucepan, stir together the milk and 1/4 cup of sugar. Bring to a boil over medium heat. 2.In a medium bowl, whisk together the egg yolks and egg. Stir together the remaining sugar and cornstarch; then stir them into the egg until smooth. When the milk comes to a boil, drizzle it into the bowl in a thin stream while mixing so that you do not cook the eggs. Return the mixture to the saucepan, and slowly bring to a boil, stirring constantly so the eggs don' t curdle or scorch on the bottom. 3.When the mixture comes to a boil and thickens, remove from the heat. Stir in the butter and vanilla, mixing until the butter is completely blended in. Pour into a heat-proof container and place a piece of plastic wrap directly on the surface to prevent a skin from forming. Refrigerate until chilled before using. Preheat the oven to 350, and on a baking sheet cube into 1 inch chunks and peel/seed the squash to get rid of the hard outer core. Peel/crush 4-5 cloves of garlic, and mix in with the squash. Salt/pepper and drizzle EVOO. Bake for about 35 minutes, until squash is tender. Remove and let cool and add salt/pepper. Remove the Thyme leaves, and move the squash and garlic mixture into a bowl. Using a fork, smash the mixture into a paste, and add both cheeses. Spoon the mixture into the center of the wonton wrappers, and drizzle the egg mixture along the sides to seal the ravioli. Press firmly all the way around the lip of the ravioli with a fork. 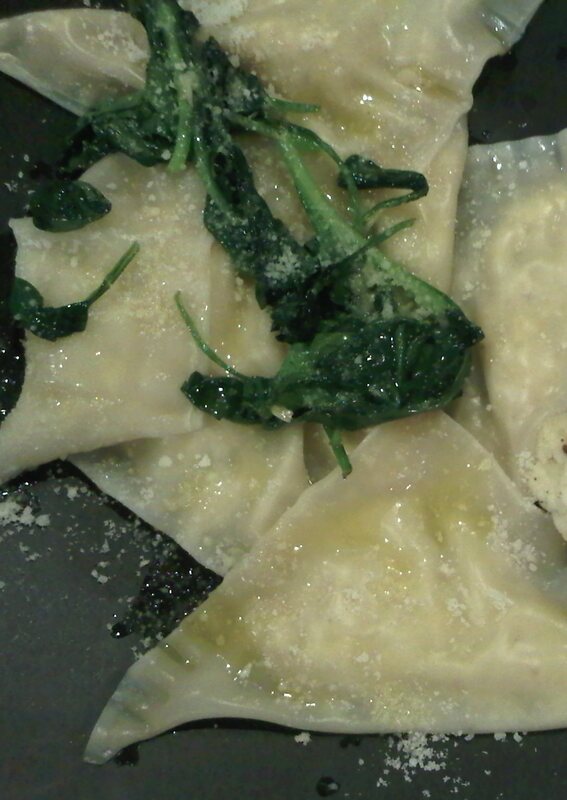 Take the spinach, finely chopped garlic heat in a skillet with the EVOO to place on top of the prepared ravioli. Drop ravioli's into boiling water for about two minutes, until they float to the top. I saw this creamy pasta on a blog that I frequent and just had to make it right away. It really is as good as it sounds! 1. Boil 2 qts. water in a large pot and cook pasta according to package directions. Drain and transfer to a large serving bowl. As soon as I saw this recipe, I had to try it. You can find the original recipe on Picky Palate's blog http://picky-palate.com/2011/01/06/oreo-stuffed-chocolate-chip-cookies/ or below. One of my dad's favorite desserts is banana cream pie. This year for his birthday, I decided to try and make it for him, homemade! 1.In a saucepan, combine the sugar, flour, and salt. Add milk in gradually while stirring gently. Cook over medium heat, stirring constantly, until the mixture is bubbly. Keep stirring and cook for about 2 more minutes, and then remove from the burner. 2.Stir a small quantity of the hot mixture into the beaten egg yolks, and immediately add egg yolk mixture to the rest of the hot mixture. Cook for 2 more minutes; remember to keep stirring. Remove the mixture from the stove, and add butter and vanilla. Stir until the whole thing has a smooth consistency. 3. 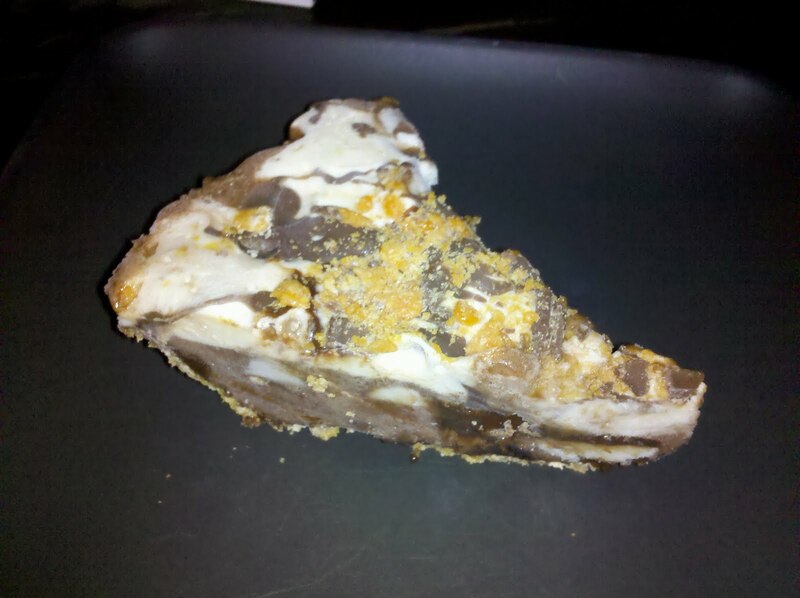 Pour melted chocolate over the cooled pie crust. Slice bananas on top of the melted chocolate layer. Top with pudding mixture. 4.Bake at 350 degrees F (175 degrees C) for 12 to 15 minutes. 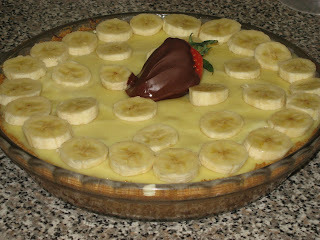 Chill and add sliced bananas on top to decorate! 1. In a small bowl, combine the crumbs and the sugar, add butter and blend well. Press onto the bottom and up the sides of an ungreased 9 inch pie pan. 2. Bake at 275 degrees for 7-8 minutes until the crust is lightly browned. Tim special requests ice cream cake or pie every year for his birthday. This year I ran out of time to use my mom's recipe, so I whipped together a bunch of ingredients and it actually turned out delicious. In a small bowl, combine the crumbs and sugar; add butter and blend well. Press onto the bottom and up the sides of an ungreased 9-in. pie plate. Warm up the fudge, and create a thin layer at the bottom of the pie. Scoop about 4 heaping spoonful of the chocolate ice cream into a Tupperware and microwave for about 10 seconds until slightly melted. Spread flat across the pie crust. Nuke the fudge again and pour it over the ice cream. Place the slices of banana on top of this layer. Scoop 4 heaping spoonfuls of the vanilla ice cream and spread across the top layer. 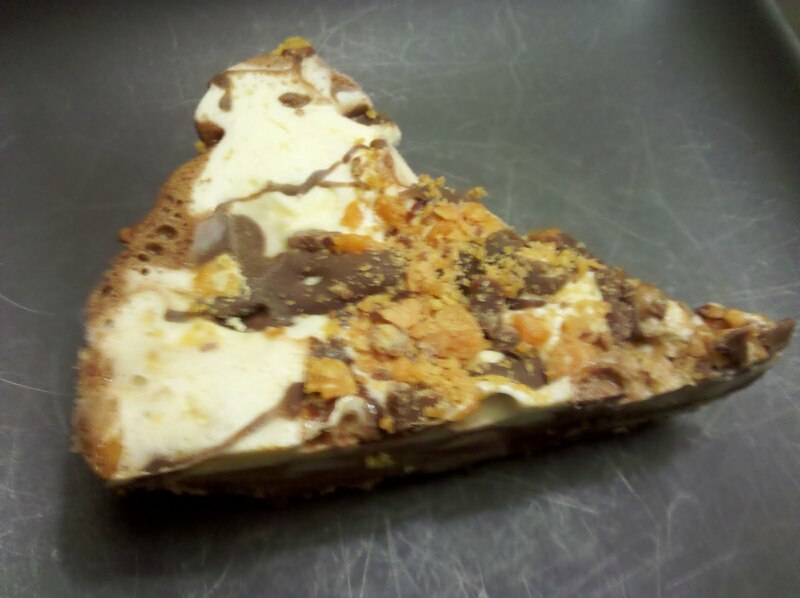 Crumble the Butterfinger into small pieces over the top of the pie. Place in the freezer for 4+ hours to harden. A friend of ours came over this past weekend with easy and healthy dinner ideas. This salad is really refreshing, especially if you like avocado and something a little crunchy! Chop up the fenel and let soak in a bowl of water with a little lemon in it (to prevent from browning). Once cleaned, chop up the avocados and mix together with fennel. Add a small squeeze of lemon, red wine vinegar, splash of balsamic and salt & pepper. Voila...healthy and easy! Place the beets in a large saucepan and add water to cover. Bring to a boil, reduce heat and simmer until tender, about 45 minutes to 1 hour. Place pot under running cold water and let rinse until beets can be handled. Once cooled, peel of the skins of the beets, chop up and season with a little olive oil, vinegar, garlic, salt and pepper. This rice is so easy and so much healthier than those boxed Spanish/Mecian rice cartons. It's slowly becoming a staple in our household. Thanks for the recipe, Sean! Recipe for 2-4 people. For more just double, triple or quadruple the recipe. 1. Brown the rice in olive oil over medium high heat until golden brown and some of the rice is starting to get darker brown. 3. Add Cumin, Garlic powder (Or Garlic Cloves), half can of tomato sauce (dump in until the water is fairly red, but this depends on personal preference. ), pepper. Stir to mix. 4. Bring to boil stirring occasionally. 7. Cover and Simmer/boil for 20 minutes on medium low/low heat. You may need to adjust the temp down or up a little depending on your stove. 8. During this period check on it occasionally. You don’t want to stir, but you may want to occasionally move the rice around and let the water on top seep down in to the rice.